Pittsburgh shot 50 percent from the field and outrebounded Eastern Washington 43-22 in taking an 84-51 decision in the fourth annual Gotham Classic. Michael Young led the Panthers with a game-best 21 points. Jamel Artis tallied 14 points, Chris Jones had 11 points, and Rafael Maia posted six points and 11 rebounds. 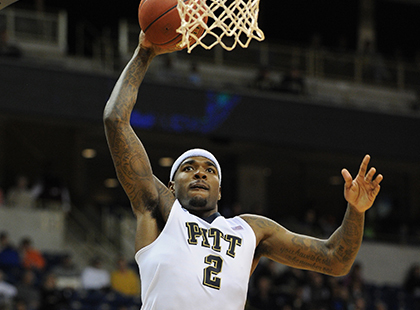 Pitt shot 28-of-56 from the field and 22-of-27 from the line in registering its seventh win of the season. Eastern Washington was paced by Austin McBroom and his 14 points. Pitt’s defense held McBroom, who had 33 points two nights ago at Davidson, to just 5-of-13 shooting from the floor. Felix Von Hofe and Venky Jois each netted 10 points for the Eagles. The Gotham Classic resumes Saturday when Davidson hosts Western Carolina in an intrastate affair. Pitt next plays in the Gotham Classic on Sunday at home against Morehead State. Eastern Washington continues its Gotham Classic schedule with a Monday tilt at Western Carolina. Tickets for the Gotham Classic Showcase Game between Pitt and Davidson at Madison Square Garden on December 20 can be purchased at http://bit.ly/1OlTywJ.